Masala paan growing in forests is a delicacy in Vidarbha In tribal pockets of central India people are still intimate with foreststhey know the fruits and vines they can pluck and cook. Even where vegetables are cultivated and market supplies organized, tribals and non-tribals alike savour wild vegetables as delicacies. One such vegetable is common night glory (Rivea hypocrateriformis), known as masala paan in the Vidarbha region of Maharashtra. In other parts of India people call it phang, phangi, phanji and phandi. Come winter or rains this sturdy vine bursts out in a profusion of heart-shaped leaves. 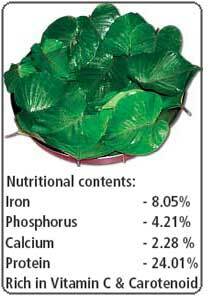 The nutricious leaves are eaten in different ways in different parts of the country. Some cook them with onion, salt and chilli as bhaji; some boil or chop them and add to flour to make chapattis or paranthas.In Vidarbha they are added to tur (pigeon pea) dal and seasoned or stir-fried with onions and besan (gram flour) to make zunka. The most popular preparation is wadisspicy, toasted rolls with gram flour and condiments. Masala paanachi wadi is a favourite among rural people. It is eaten hot or cold, as a snack or an accompaniment to a meal, or simply wrapped into a wheat or sorghum chapatti when in a hurry. Vijaya Tulsiwar of Dilasa, who showed Down To Earth how to make the dish, said covering the rolls with leftover chapattis while cooking serves two purposes. The chapattis trap the steam to enable the wadi cook properly, and also absorb the extra steam which would have made the rolls soggy. In the process, the stale chapattis lose their hardness and taste fresh. The vine grows in forests and around farms. People say it can be cultivated by planting a portion of its tuberous root, but experiments carried out by ngos Dharamitra in Wardha district and Dilasa in Yavatmal show the plant does not respond well to cultivation efforts. It is disappearing in the wild as well. The roots of masala paan are traditionally fed to cattle to enhance milk production. With the expansion of milk trade in tribal areas the roots have been extracted aggressively. Chapattis left over from an earlier meal one or two Wash the leaves. Add salt, rice flour, chilli powder, turmeric powder, ginger-garlic paste, til and ajwain and a little oil to the besan. Add water and mix well to make a thick paste. Spread a layer of the besan mix over the glossy side of the leaf. Roll it, starting with the broad end and stick the pointed end of the leaf to the roll with a little paste. Heat sufficient oil for toasting on a skillet. Place four rolls on the skillet. Dribble a little oil onto the rolls. When one side is done, turn the rolls over and cover with a stale chapatti. This is to ensure that the inner layers of the roll are properly cooked. Serve with chutney or dip of your liking.